Matt Nolan scored for Holbeach against Wisbech. Holbeach United continued their charge to top spot in the United Counties Premier Division with a crucial Boxing day win over local rivals Wisbech yesterday (December 26). A goal midway through the first-half from former Posh striker Matt Nolan was enough to see off in-form Wisbech at Carters Park. 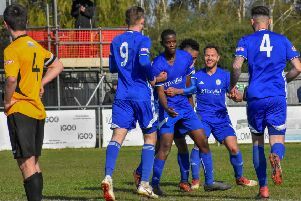 It was Nolan’s first goal for the club against a Wisbech side that had been strengthend by a couple of players on loan from higher level Spalding United. Second-placed Holbeach are now five points behind leaders Rushden & Diamonds with two games in hand. Rushden’s game with Wellingborough was abandoned with 25 minutes to go because of floodlight failure. Huntingdon’s miserable form continued with a 3-0 home defeat at the hands of Eynesbury. Huntingdon are sliding to mid-table obscurity. Wisbech remain fourth, five points behind Yaxley who have a tasty local derby at Peterborough Northern Star today (December 27, 1pm kick-off), while in Division One promotion-chasing Peterborough Sports are due to host St Neots Saints at PSL (3pm). There’s also a Division One derby between Blackstones and Bourne today (2pm). Today’s scheduled games involving Deeping Rangers and March Town have both been postponed. Spalding host Evo Stik Division One South leaders Sutton Coldfield tomorrow (December 28, 3pm). The Tulips continued their excellent form with a 1-1 draw at Lincoln United yesterday. Spalding are unbeaten in their last 11 matches and sit fourth in the table. Jamie Thurlbourne fired them ahead at Lincoln from the penalty spot early in the second-half following a foul on Andrew Tidswell, but the home side found an equaliser also from the spot, 20 minutes from time, although guilty man Nathan Stainfield was adamant it was a poor decision. It’s two draws from two matches at their new Zeeco Stadium for Stamford. Lewis Carr shot them in front after just 11 minutes in their Boxing Day derby against Grantham, but the visitors levelled with an outstanding set-piece strike 11 minutes from time. Stamford are at home again tomorrow against high-flying Curzon Ashton (3pm). Lincoln United 1, Spalding 1 (Turlbourne). Holbeach 1 (Nolan), Wisbech 0. Peterborough Northern Star v Yaxley (1pm). Peterborough Sports v St Neots Saints (3pm). Spalding United v Sutton Coldfield (3pm).